Your lift contains many moving parts and electrical components including vital safety features, that like your car need servicing annually as recommended by the British Safety Standards. This not only ensures your lift operates when needed but will also extend the life of your lift. Our fully qualified engineers will check all mechanical and electrical parts to make sure they are operating correctly and make any adjustments as necessary. Included in your service will be a complete health check (an MoT for your lift). You will be given a report advising items that are in need of immediate attention or advisory repair. Should your lift fail to operate we offer a 24-hour helpline and we have fully qualified staff to talk you through it free of charge. If we are unable to rectify the fault over the phone, we can arrange a visit from one of our engineers. Repairs take priority as we know that your stairlift is your independence. We can repair most makes/models of lifts and aim to be with you the same day. We also have our comprehensively stocked vans carrying a full range of spares. Have a lift that is no longer required? We will remove it no matter of age or condition. Depending on age or condition we may even buy it back. Having a stairlift installed in your home can be life-changing. It allows for easy access to the upper floors and for most people brings a feeling of freedom and independence that they had thought was lost to them. Here at Simply Stairlifts it gives us great pleasure to be able to bring this wonderful mobility aid to those who need it across Bristol, Dorset, Hampshire, Gloucestershire, Oxfordshire, Somerset and Wiltshire. On installation, however, we always warn our customers that a stairlift is not a metaphysical device that will keep on giving tireless service forever; it is a machine, like any other, consisting of a collection of numerous moving parts and electrical components. Just like your boiler or car, a stairlift needs to be properly maintained to keep working properly and ensure its life is extended for as long as possible. Together with its built-in safety features, a stairlift is a complex piece of engineering. New stairlifts generally come with a warranty that includes free initial services, but if you have a reconditioned or old stairlift you need to have it checked over thoroughly by professional engineers – like those at Simply Stairlifts – at least once a year. The cost of a service is certainly not an unnecessary expense. Not only can it prevent you from being left in the lurch with a faulty stairlift, but regular maintenance can also prevent you being left facing a bill for expensive repairs or even having the stairlift condemned and having to invest in a new one. Because we want you to be able to enjoy the benefits and convenience of your stairlift for as long as possible, the Simply Stairlifts team are happy to offer you a stairlift service contract, tailor made to suit your particular stairlift and circumstances. We’ll schedule a service at regular intervals, when it suits you, and you can rest assured that your stairlift won’t let you down. Our fully qualified engineers are committed to taking care of you and your stairlift, and will check all mechanical and electrical parts to make sure they are operating correctly and safely, make any necessary adjustments, and lubricate the track. 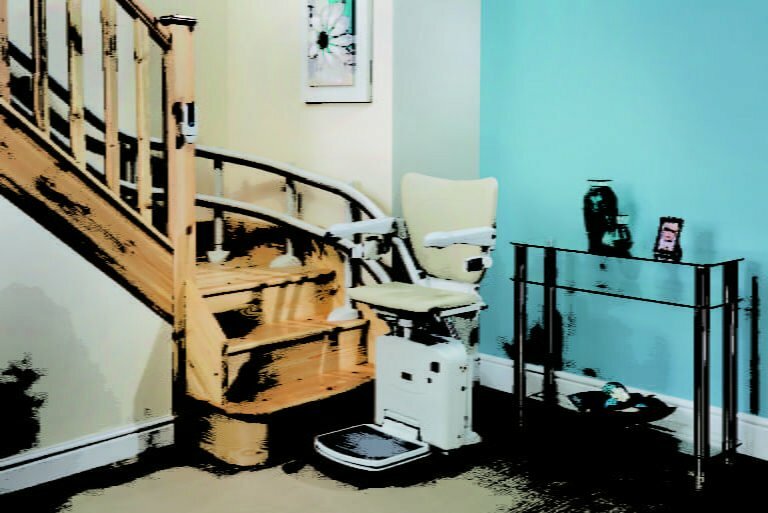 The stairlift service will include a complete health check – you could say an “MOT” for stairlifts – and you will be given a report detailing advising of any items that need immediate repair or that should be watched for future developments. Never use solvents, bleaches or abrasives to clean your stairlift because these could damage the electric circuits or delicate parts of the stairlift. Most important is to educate your family members on how important the stairlift is to you, and discourage youngsters from using it as a toy! You’d be surprised how many stairlift repairs we’ve had to undertake because of joyriding grandchildren. Whatever make or model of stairlift you have, contact Simply Stairlifts to arrange for a one-off service or maintenance contract to keep it in good condition. For more information please get in touch with the friendly Simply Stairlifts team.